I'm using iTerm2 Build 3.0.15 and writing a script that opens a new window and prints "hello world" to the screen. Really, I'm interested in being to run any command but using echo "hello world" as a starting point. create window with default profile command "echo hello world"
What do these broken pipe and window id 6415 errors mean? write text "echo it works!" The write command, when not using without newline, executes the write text command because of the default added newline after the "text to send". Thus the window stays open after the command completes, ready for additional use. write v : Send text as though it was typed. command "bash -c \"echo hello world && read\""
The use of read makes bash wait for the user to end the line (i.e. by pressing enter) before exiting. 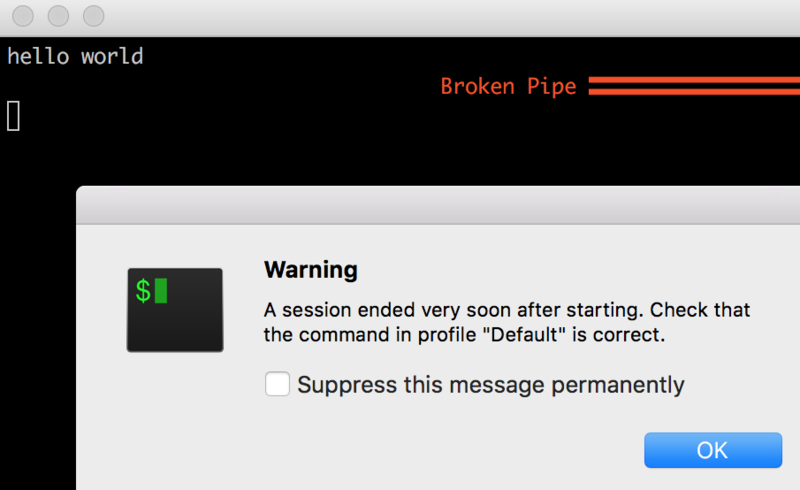 Pressing enter within 3 seconds will still yield the warning, as this is an iTerm feature which you can disable by checking the box on the alert, and control more precisely in Preferences → Advanced → Warn about short-lived sessions. Not the answer you're looking for? Browse other questions tagged terminal applescript script iterm . osascript dialog box is blocking.